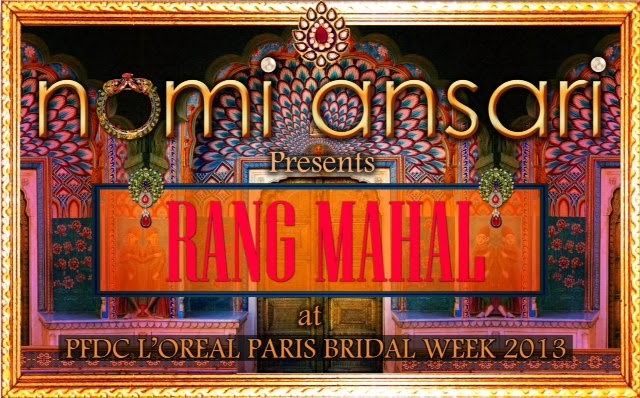 It came as no surprise to those who know him – while designing his recent collection ‘Rang Mahal’at L’Oreal Bridal Week 2013, Nomi Ansari had more than 38 colors on his palette. His is a name that is completely trusted by brides when it comes to color: they famously choose two colors while the rest is left in the hands of ‘the king of color’. It is no wonder that his own personal space at home is all white and serene to give his mind a break and a fresh start every morning! Nomi is witty and humorous, and it was a pleasure to interview this remarkable designer who started off his career by dressing up his cousin for her graduation dinner in a simple short shirt, and cap sleeves with a tapered silhouette – which is how it all began. FUCHSIA talked to Nomi about today’s bride ahead of the busy winter bridal season, and his transition from his forte of western clean cuts and color blocking, to ethnic embroidery and shimmer. How do you feel the brides have changed in the last 10 years, in terms of their selection of style and independence? I feel that a few years ago, brides displayed more individuality. It was what they wanted to wear for themselves. Today, it seems the brides are highly influenced by Bollywood trends, social media and their social circles. It’s less about what they want to wear, and more about what a certain Bollywood actress was wearing or what a friend wore. There is a lot of awareness and competition due to social media but the individuality aspect is rare. Of all the traditional outfits like gharara, lehnga, sharara, farshi peshwas, angarkha etc., which one according to you, has an everlasting appeal, irrespective of what’s in fashion? I would say it’s the Dhaka pajama, which is a mixture of a sharara and a gharara. Its two-legged wide pants compliments the Asian silhouette perfectly. It’s definitely the most versatile and classic look. You can wear it with both a short shirt and a long shirt depending on what’s in fashion. Afterwards, you can even wear it to a relative or a friend’s wedding without overdoing the look. What is your favorite color for an Asian bride? For a bridal color it all depends on the skin tone. I personally like deep scarlet red, fuchsia and coral as these compliment most Asian skin tones. 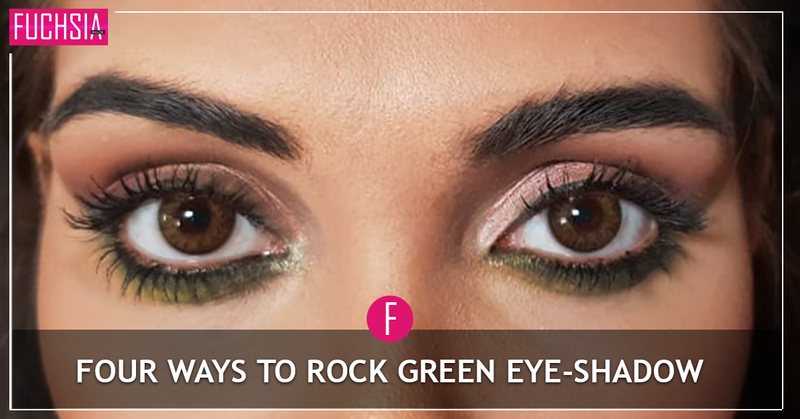 The right color is crucial in achieving a desired look. When you started, the fashion industry was very different: in particular your style and cuts were unique and totally new. How did the customers respond? It’s been almost 13 years since I started and introduced the invisible zippers, the princess cuts, the linings and the finishing. We came up with clean cuts that were more western-oriented and solid color blocking which was received very well by the younger generation and women who were weight conscious and wanted to show their silhouette. 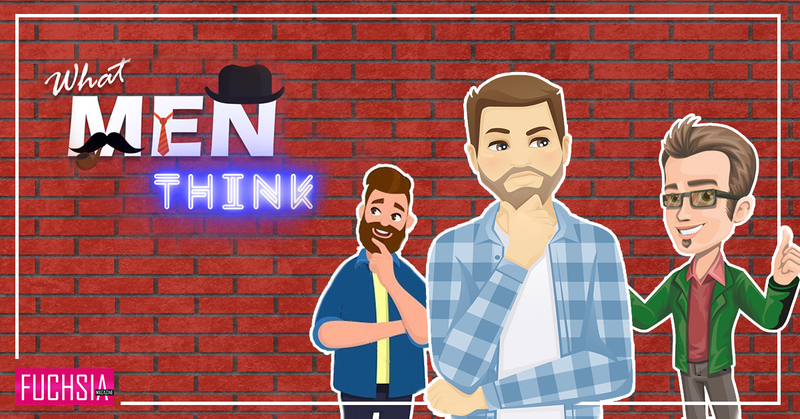 Initially, with a limited budget it was difficult to market myself properly, so technically it took me three years to establish the brand and be known in the social scene. Over those three years, I also started embroidery and embellishments as we wanted to enter into the bridal market. Another thing that was and still is our trademark are the tassels and the long dupattas, which became very popular as the girls could wrap the long dupattas around and style it any way they wanted. It became so popular that when I went to India in 2003 for a show, everyone wanted the ‘chunni’! You look so young and at the start of your career you must have looked even younger. Did that present any challenges? (Laughing). Yes, looking young did present some challenges initially. Kapray walas (clothes’ sellers) wouldn’t take me seriously; and the karigars would try to fool me. It led me to keep a beard to look a little mature. But there was nothing major, just small incidents like these, which are amusing to recall now. What was your objective when designing for the bridal week collection? I just did what is my forte: colors! The collection was based on post partition that had a little twist with prints & textures. The look is very traditional but at the same time with different materials and textures we have brought a modern feel to it. The entire palette for ‘Rang Mahal’ had 38 colors. Each garment had about 8-13 textures and colors. We used prints, chiffons, velvet, brocade and many more. Each outfit was customized and by the end of it I literally became almost colorblind! We used applique, lots of textures and various colors. We added prints with colors, nets, velvets, chiffon, brocades, and embroidery. We decided the palate and then got our own brocade made from Banaras Colony. Why did you go for a traditional, post partition look for the bridal week? Well, we have clients and people coming to us and saying they want something different. So what can be different? That’s the question. In Pakistan styles and designs are usually highly influenced by the West, so we decided to go back to our roots. We have tried to bring those Eastern silhouettes and traditions back which we have lost completely. We have gone for the clean cuts but have given them a little twist with prints and a mix & match of textures. We added new elements but we made it all look very traditional and classic. If you look at any outfit in the collection, each and every piece can be used on its own. Nothing western; it’s all very desi and traditional. Are the wedding and valima joras different for brides? Should they be different in your opinion? Yes they are and should be different. The color of the jora and the jewelry makes the difference and determines the style. We recommend a very contemporary look for the valima day. For the wedding day, the Nomi Ansari bridal look is very traditional, colorful and classic. 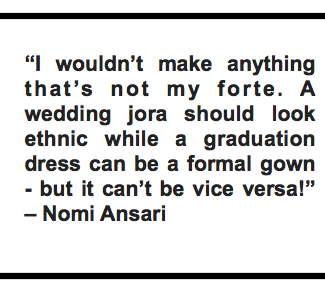 What is the Nomi Ansari classic bridal look of 2014? It’s a very eclectic look with a dupatta that compliments your shirt and your lower garment that compliments your dupatta. Put together, these three random items look like one ensemble but when you separate them all each of these three can be used on their own as well. This way, you can play with colors and still have a unique and different look each time. In the end, everything should compliment a bride – she has to look beautiful not the clothes. 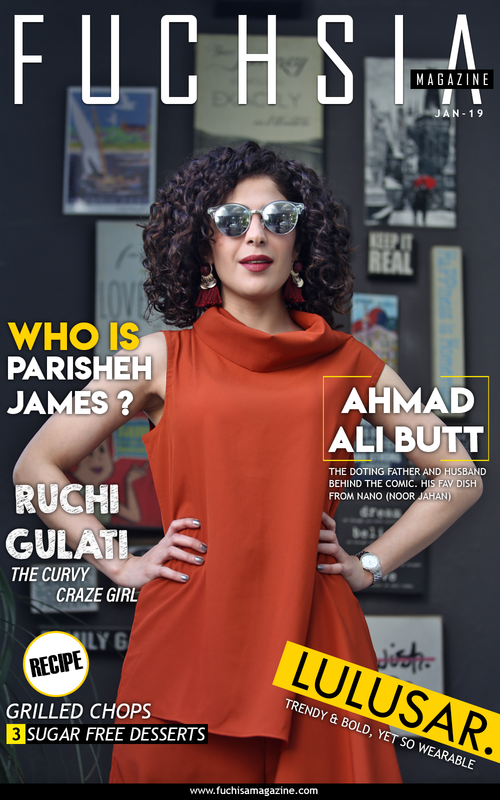 FUCHSIA readers can enjoy Nomi Ansari’s bridal collection of opulent wedding ensembles and stay up to date on all the latest fashion trends ahead of the busy wedding season in Pakistan.